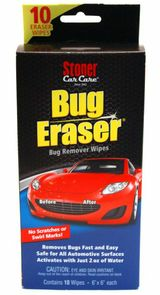 Stoner Bug Eraser effortlessly removes baked on bugs, bird droppings, and road grime with just gentle rubbing. It contains a softening agent that agent that loosens bugs and lubricates paint finishes while synthetic microfibers grab and lift off the bugs with ease. It easily slides across the car without scratching. Stoner Bug Eraser wipes will not scratch or cause swirl marks on paint finishes the way netted bug sponges or course foam blocks can. 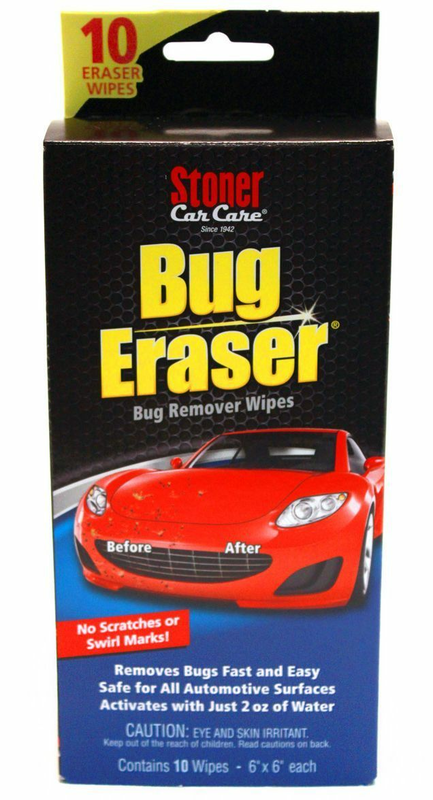 Stoner Bug Eraser wipes contain no harmful solvents or degreasers that can ruin plastic grills, bumpers, headlights, or mirror housings. Safe to use on all exterior vehicle surfaces including paint, plastic, rubber, chrome, and glass. Stoner Bug Eraser wipes activate with just 2 oz. of water. Just moisten a wipe, no hose required! Once wet, gently and easily wipe away bugs and then wipe the surface dry with a microfiber towel. Ideal for spot cleaning or pre-washing! Wet one wipe with as little as 2 oz. of water. ALWAYS use wet. Gently wipe bugs from vehicle surface using the blue side, which contains the high lubricity softening agent. Wipe surface dry with a clean, dry, microfiber towel or spray clean with water. Discard or recycle wipes after use. Cleaning tips: As bugs accumulate on the wipe, fold it over to expose a clean surface and continue cleaning. A final buff with a clean, dry microfiber towel will produce the best results.